You may already know about the default(T) operator in C#. It's been used to get the default value of the specified type. The default literal in C# 7.1 is just a shorter form variation of the same, to reduce the redundant code. The new expression, using the default literal, allows you to omit the the type and keep the code simple. But internally, it acts like default(T) only. An expression with this classification can be implicitly converted to any type, by a default-or-null literal conversion. To know more about the C# 7.0 features, checkout my book 'Mastering Visual Studio 2017'. Was it clear? Do let me know, if you have any queries. To know more about the C# 7.0 features, checkout my book titled 'Mastering Visual Studio 2017'. 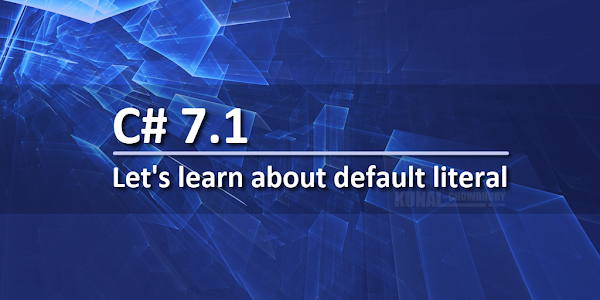 If you have come this far, it means that you liked what you are reading (Let's learn about default literal in C# 7.1).